The title of my daily adventure is probably a little misleading. I didn’t go to the Grand Canyon today, but it is a stop on this Reader’s Digest Scenic Drive. I plan to visit it at a later date to ensure good weather. Hopefully that doesn’t end up being a mistake, because it was absolutely gorgeous today. The portion of the loop drive that I conquered today was southeast of the Grand Canyon near Flagstaff. I started out the morning visiting the complex across the highway from the campground. It included a motel, filling station, post office, restaurant, trading post, and of course restrooms. In order to charge my computer and finish posting my blog, I ordered breakfast. I can’t imagine trying this in the days of dial up. I probably wouldn’t have left the restaurant all day. Eventually, I was ready to head toward Flagstaff. After breakfast, Petey and I visited Wupatki National Monument located 30 miles north of Flagstaff. The Wuptaki National Monument is home to a variety of pueblos once inhabited by the Sinagua and Anasazi Indians. The ruins include Box Canyon, Lomaki, Nalakihu, Citadel, Wapatlo, and Wukoki. The pueblos were established in the 1100s and the land was farmed without the presence of water. The inhabitants hung pottery bowls and built check dams to collect rainwater. If rainwater didn’t come, they had to walk ten miles to collect water from the Little Colorado drainage. The ruins are typical of many pueblos found in this region. Walls are constructed of nearby sandstone and limestone and are cemented together with local soils. The area was abandoned in the mid 1200s. Archaeologists aren’t sure why, but a lengthy drought could have been a cause. The Citadel, the modern name given to the ruin, was built atop a rock. The walls extend up from its edge. Archaeologists consider the pueblo a remarkable achievement and wonder why the Anasazi often built so high. Was it defensive, for sun and breeze, or to protect the limited cropland along the slopes and wash bottoms. A unique feature found at the Wupatki ruins is the ballcourt. Rather common at ruins in southern Arizona, ballcourts are rare in the northern part of the state. Because of the work involved in building a ballcourt and due to the amount that have been found in the state, it has been speculated that ball games were an important part of the Wapatki people and their southern neighbors. The Wupatki ballcourt is 78 feet wide, 102 feet long, and has six-foot high wall. The views surrounding the pueblos include the Painted Desert as well as the San Francisco Peaks. The volcanic mountains are the highest point in Arizona and are considered sacred by the modern day Navajo and Hopi. In addition, the Wupatki area includes several blowholes. One blowhole is located near the Wupatki ruin. There is no evidence that these blowholes, a crevice in the earth’s crust that connects to an underground passage known as an earth crack, were used by the prehistoric people. Depending on the air pressure, air either blows out of the hole or is sucked in. Today, the air pressure outside must have been lower than the air inside the crack system, as I felt a breeze come up from the surface. A 35 mile road through the Coconino National Forest connects the Wupatki National Monument to the Sunset Crater Volcano National Monument, our next stop just 19 miles north of Flagstaff. The volcano erupted sometime between 1040 and 1100 and its ash covered 64,000 acres of farmland and created a 1,000 foot cinder cone known as Sunset Crater. The volcano’s summit stands 8,029 feet and its base is one mile in diameter. The crater depth is 300 feet. A variety of different types of hardened lava flow surround the cinder cone including spatter cones. I took the mile loop through the lava field and by the cinder cone for a closer look along with a variety of other tourists. It must be spring break in Minnesota and Wisconsin as several folks from the northern parts were escaping the cold for a few days. Petey and I continued on to visit the Walnut Grove National Monument just outside Flagstaff. Gina, my GPS, took me down Old Walnut Canyon Road, which is a winding, poorly maintained dirt road through the forest. I got to a section grooved with large tire ruts. It looked a little too “off road” for me, so I turned VANilla around in the middle of the path. The nicest guy was following me. I told him where I was trying to go. He said, the section in front of us was the worst part of the road and to just stay on the high ruts. REALLY, the HIGHWAY…I don’t know what Gina was thinking. We chatted a bit longer about trails in the area, but the more I thought about it, I decided to follow him over the ruts and waved bye when he turned off to go mountain biking. The Walnut Canyon National Monument was interesting. Of course, it was listed on www.geocaching.com as a virtual cache and an earth cache so I picked up two more caches while I walked the one mile Island trail which wound around an island section of the canyon just below the rim where the ruins were built. The Sinagua Indians took advantage of the natural recess of the limestone and simply built walls in the shallow caves. 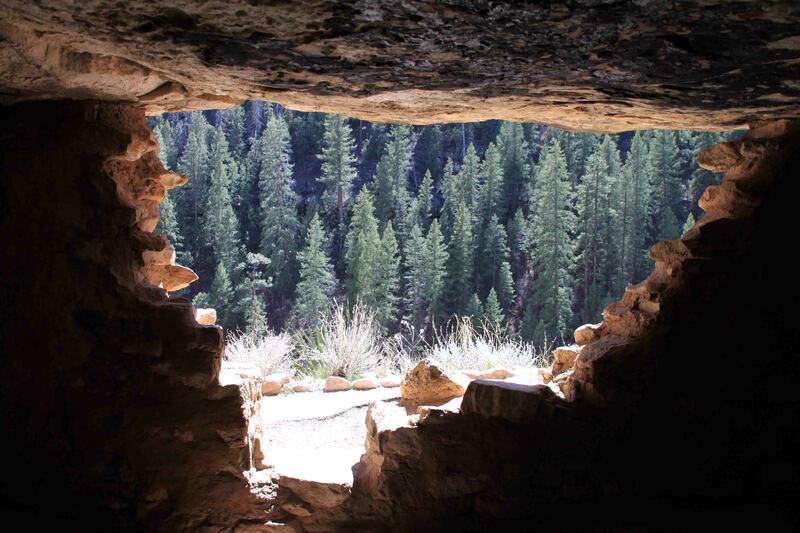 The dwellings at Walnut Canyon are around 900 years old. The Sinagua Indians used the dwelling for approximately 100 years before they departed the area. It is thought that the Sinagua Indians assimilated into the Hopi culture in the 1400s. Another couple stood at each sign and read it aloud. One sign discussed switchback trails. The woman, in her 50’s, asked, “What is a switchback?” I was surprised she didn’t know, so it has prompted me to survey my readers…Do you think “switchback” is a common word, or would one only be aware of it from living in mountainous areas? Petey and I called it a day after our visit to Walnut Canyon. After surfing the Internet, we found a campground with a shower that was open about 14 miles south….FINALLY. As VANilla left Flagstaff for Cave Springs Campground, suddenly before me was a mile wide canyon with a 1,000 foot drop. I was so surprised…I guess I should have referred to my Reader’s Digest book sooner. Nice blog! Sounds like a busy day. I liked the painted desert pic. Switchbacks…I hadn’t thought about the term before but I am thinking it probably is tied geographically and it is possible a few persons have not encountered the word in their lifestyle. I have heard that there are people in large metropolitans who have rarely or never left the city. That could be urban legend but (gasp) if true, they would encounter all sorts of new words and phrases used in everyday life. switchback..I would think most people would know this word….great tree pic…….love az. Can’t even remember the first time I heard the word “switchback”. Seems so commonplace now, hiking and biking. Interesting…. Great blog, sounds like a fun day! In reference to the word switchback … I can’t remember ever hearing it before I used trails in the Adirondack Mts. & after that it became common to me. So if someone has never used trails that probably have never had a reason to hear or use the word.